Ten years ago, America’s home builders were in the midst of constructing 672,000 single-family homes. Five years ago, they were building 990,000 homes. Last year, they were building 304,000. And now that figure is down to 252,000. Very interesting and important facts. We over built for a few years. But if you figure that spike for 2003 to 2006 represents a half million extra homes, then we should have already worked off the excess. Of course many young people are failing to move away from home because they have jobs. People are no doubt doubling up. The divorce rate is down. So demand is depressed below normal levels. If the economy could be stimulated and demand recovered we might have to build above trend to make up for this slow down, which would further stimulate the economy. This suggests to me that we might see a high multiplier for stimulus. 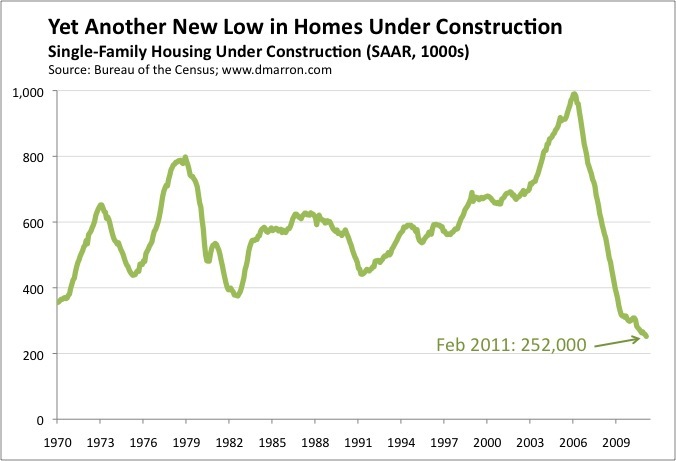 On the other hand we might suspect that we were building too many homes even before the 2003 to 2006 spike. Which would leave us with a larger group of homes to sell off. Of course the baby boomers are now beginning to retire and maybe moving out of single family housing. This would push things down. So who knows, but very interesting. Jobs, without one most people can neither buy a home or make mortgage payments. Wages for most people have not kept pace with real inflation, things like healthcare, food and energy – you know things humans need to live, but that the government statwonks refuse to utilize in their monthly propaganda numbers because it would make their lies too obvious. When 20% of the workforce is unemployed or working part time for less wages and 42 million people are using food stamps, it is difficult to argue that we are in any way in an economic recovery as housing clearly indicates. The Fed cannot create a recovery, they can merely conjure illusions on Wall street as the Dow Jones and the S&P clearly reflect. Recovery, if and when it comes will be a long slow slog. Rome wasn’t torn down in a day, as I like to say. Jobs, without one most grouping can neither buy a residence or achieve mortgage payments. Consequence for most group someone not kept quantify with historical inflation, things equivalent aid, food and vigor – you eff things humans requirement to whippy, but that the governance statwonks keep to utilize in their monthly propaganda numbers because it would get their lies too manifest.